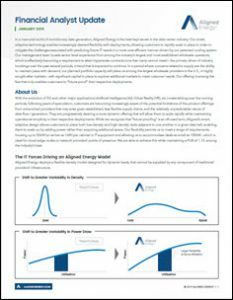 In a mercurial world of evolutionary data generation, Aligned Energy provides adaptive technology that enables increasingly desired flexibility with deployments. This technology allows customers to scale in place in order to mitigate the challenges associated with predicting future IT needs in a more cost-efficient manner driven by its patented cooling system. Aligned’s design allows customers to place both low-density and high-density racks adjacent to one another in a given data hall, enabling them to scale up by adding power rather than acquiring additional space. The management team includes veterans of established wholesale operators, which the company states has been the primary driver of industry bookings over the past several periods — a trend that is expected to continue. Its portfolio contains 550 MW of capacity between existing and expansion facilities across Dallas, Phoenix, Salt Lake City and Northern Virginia.